There is no a greater joy in life than having children of your own; getting to nurture them, watch them grow into amazing people and guide them through life. Once in a while, during birthdays, holidays, when celebrating milestones and achievements with your child, gifts are an exceptional requirement to show how much you appreciate them and how proud are you of them. Luckily, gifts do not need to be expensive, they have to come from a place of love, and what better way than to make them yourself? 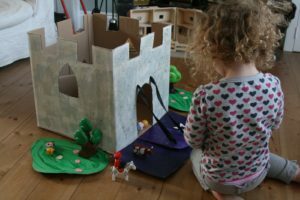 Children love stories about royalty and fairy tales such as sleeping beauty, the beauty and the beast, Jack and the Beanstalk, so you can be sure they will be delighted if you turn one of the stories into something real like creating a castle. They are quite easy to make at home, and if you do not know how to do it, there are always videos online guiding you on how to go about it. You do not need much stuff, just cardboard, a few trinkets for decoration, glue, confetti for decoration and a few more things to make the castle beautiful for your kid. Kids develop interests as fast as they drop them, and most of these interests are inspired by stories we read to them or the cartoons they watch. Hunting for treasure is a fun activity for your kids, and you can create a treasure chest for them to store souvenirs they find and keep as they grow for them to reminisce about when they are all grown up. It is also inexpensive; you can use card boxes or cereal boxes to create a dome-like chest and paint the outside of it to resemble cool treasure chests like those of pirates – your kids will love it. If your children (either boys or girls) like building stuff, then a tool belt for them will come in handy. There are a lot of detailed tutorials on the internet on how to make one with things lying around the house, especially fabric and sewing kits; and line the belts with plastic tools – so that they do not hurt themselves – such as hammers, spanners and wrenches. Watch your children play pretend with the tools and enjoy pretending to fix things around the house; you never know; they could be future engineers. For parents who are tired of buying many gadgets and tech toys, a stuffed animal is another way to go, and they can easily be crafted by hand. 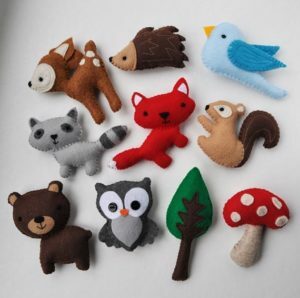 Make your kid’s favourite animal into a stuffed toy using only felt wool, a pair of scissors, sewing kit and a steam iron; adding appendages like ears and wings and noses will make the stuffed toys quite adorable. They are inexpensive and simple to make, and your children will want to cuddle up with them during nap time. Home-made presents are inspired and thoughtful, fun to make, made with love and a personal touch, and save on money. Wrapping your kids’ gifts will give you and them the satisfaction of tearing into the packaging to discover what is inside; just because they are made at home does not mean they cannot be wrapped. This is precisely why The Works have this amazing offer of 3 for £2 Cards and Wrap to make sure your gift looks neat and ready to be open.